There are popular composers and famous artists for the Cuatro. These are slightly different, and most of these persons have some sort of affiliation with Venezuela. The most famous being Simon Diaz who has brought incredible masterpieces such as Caballo Viejo (international versions derived from this song are The Gypsy Kings “Bamboleo”) who brings the sound from the Venezuelan lowlands on a global scale. 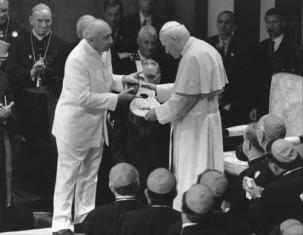 In the image below you see him presenting pope Jean Paul II with a Cuatro. Gualberto Ibarreto also shares a familiar role in Venezuelan folklore music using the Cuatro with favorite songs such as the “Guacara” all being the epitome of folklore. When speaking about soloist artists or “solistas” we cannot go without mentioning the famous Cheo Hurtado who is among the greats bring out new methods of interpreting music and bring the Cuatro to the next level. In more modern times from the most recent generation of Cuatristas, we have Jorge Glem forming part of C4Trio (a famous Cuatro band wit Hector Molina and Eddie Ramirez). For these Cuatristas, it’s better to hear what they are capable of as no description will come close. Among greats, there is also Carlos Capacho who is internationalizing the Cuatro’s style of play by interpreting Jazz music. Even Pope Jean-Paul had a Cuatro given by legend Simon Diaz!